When it comes to sound, the likes of Denon, NAD, Rotel, Polk Audio, Monitor Audio, Definitive Technology, and Klipsch have you covered. Denon, for example, has just brought out the AVR-X8500H, the world’s first 13.2 channel AV channel receiver. It offers a multi-dimensional listening experience from Dolby Atmos. Master the Dolby Atmos sound with a 7.1.6 or 9.1.4 surround sound speaker system with six additional overhead speakers, or Dolby Atmos height module elevation speakers for the ultimate home theatre experience. Denon has delivered on the perfect entertainment component in the AVR-X8500H. Of course, there are many more cool features on this AVR, which will make your hi-fi literally sing from the rooftops. Choosing the best speakers is a big deal when it comes to rounding off your hi-fi and AVR experience, mainly because speakers are the most visible component of your setup. You want speakers that suit your budget first and foremost, right? This is where entertainment junkies can get tripped up because, for some, sticking to a budget when shopping for the best speakers is like saying no to extra cheese on a pizza. You can stick to your budget and get great value for money though. There are a lot of good speakers out there, but they’re not all in the same class. The main thing to remember when looking for the best speakers is that they’re the part of a hi-fi system which can change the sound of the system the most. This is why when you’re shopping around, you need to think of your long-term home entertainment enjoyment, and make sure that you get speakers that suit you and your hi-fi system. You’ll know that you’ve chosen the best speakers when you get great bass performance. We recommend floor-standing speakers for the ultimate bass experience. The size of the speaker matters not, because even the slimmest of them and even small bookshelf models (work best in smaller rooms) can pump out incredible bass. If you’re on a tight budget, start by sizing up some stand mount or bookshelf models, and throw in a couple of solid stands for better output quality. Like we said, bookshelf and satellites can be bass limiting, but if the room is small, they work like a charm. The best dynamics and bass come from floor-standing speakers if the room is fairly big. When you’re sure that you’ve chosen the best speakers, you need to get the most out of them. Always use an AVR and hi-fi receiver, so you don’t damage your speakers when you’re in full-on party mode. If you’re looking around your bachelor pad and thinking that there’s just no way, consider a soundbar. You also have the option of in-ceiling or in-wall speakers, so floor space shouldn’t be an issue. 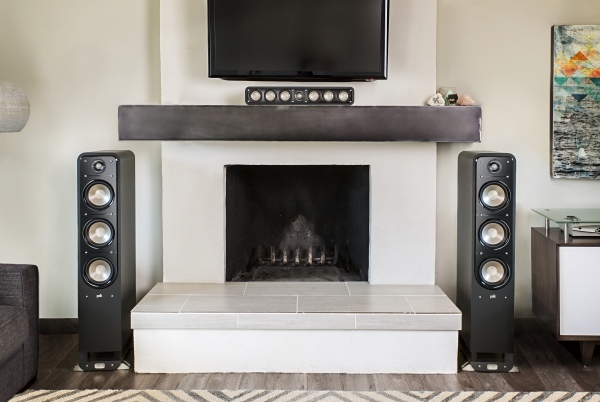 You can get as creative as you like with speakers, so there’s no reason not to have the best sound for your home entertainment, regardless of the amount of space that is available. And why keep it indoors? Outdoor speakers love the elements as much as you love your tunes. Contact us for more information about the best speakers on the market.